-The following documents what brought the first back-to-the-land settlers to Floyd during the 1970s and ’80s. It first appeared in an August 2018 Floyd Press news insert magazine titled A Place Called Home. Homesteading, homeschooling, community, beautiful land and good water were some of the reasons a wave of new pioneers began settling in Floyd throughout the 1970s and ‘80s. Some lived in tents or off-grid and some rented old farmhouses for as little as $100 a month, while creating new foundations for more self-sufficient lifestyles and raising their families. Pete Bartell, a former Wimmer real estate agent and owner of Action Video (where The Republic of Floyd is now located), remembers putting a land-for-sale ad in Mother Earth News magazine back in the early ‘70s. The ad, which described Floyd as a “paradise,” drew some of those back-to-the-land settlers. The family that founded Travianna Farm – one of the first of several Floyd homesteads to practice communal living – saw a different ad. It was 1971 and Ruth Bason’s son Will saw a Floyd farm “for-sale” ad in a newspaper out of Raleigh, NC, where the family was living at the time. Ruth, the matriarch of the extended-family farm, liked to say, “I had never heard of Floyd the morning I bought our farm here.” She, a horse riding instructor who passed away in 2016, talked about falling in love with the area while driving on the Blue Ridge Parkway and thinking, ‘If the farm isn’t the backside of a mountain, I’m going to buy it on the spot.’ And she did. Jack Wall, Wall Residences’ director and Hotel Floyd/ Floyd Eco-Village co-owner, was an early visitor to Travianna, who felt “the draw of living off the land in a small community with friends.” Wall lived at the farm for a while, as did Kamala Bauers, who years later married Wall and is currently co-owner of their entrepreneurial enterprises. Soon after Wall’s first visit in 1973, he gave notice at his government job in Boston, got a bus ticket to Roanoke and hitched to Floyd County with all of his possessions on his back, he writes in Randall Wells’s online serial book Floydiana (randallwells.com). Sixteen Hands founding members Ellen Shankin, a potter, and Brad Warstler, a woodworker, came to Floyd in 1976 with a friend whose boyfriend lived in the county. “It was late spring and the rhododendrons were in bloom,” Shankin wistfully remembers. Floyd’s Old Mill Coop, an early community hub that sold bulk natural food, was also a draw for Shankin. It represented “people with interests like mine,” she said. Shankin soon connected with Polseno and Hensley through her ceramics teacher in one of many synchronistic line-ups that so many early transplants to Floyd have spoken of. “People of common mind and few resources shared the cost and responsibility of land ownership based on new ideas,” she has said about those formative years. Avery, who is writing a memoir that includes details of some of her early Floyd experiences, was a co-founder of Blue Mountain School, a parent-run cooperative and an off-shoot of the homeschooling community that also brought newcomers to Floyd. “We created our own seasonal celebrations that honored the earth,” said Katherine Chantal. Chantal, an herbalist and another co-founder of Zephyr and Blue Mountain School, has been creating and facilitating community life passages – such as weddings, memorials and blessingways for expectant mothers –for several decades. Some found Floyd through the Summer Solstice gatherings at Riverflow, a neighborhood community along the Little River in the northern part of the county. Circles, singing, pot luck feasting and volleyball games were always part of the celebrations where longstanding friendships were made. The Museletter, a monthly community forum that was mailed to about 150 subscribers for more than three decades, was a beacon to many newcomers. Sponsored by the CERC (Community Educational Resource Coalition), a non-profit formed by the early alter-natives, the Museletter featured bulletin boards, literary and artistic musings, ideas on self-reliance, growing and preserving food, holistic health, peace and justice activism, home schooling and more, and was a key to bridging the rural miles and keeping the community connected. Artist and musician Ruth Neumann (Staroot) found Floyd through the Museletter. She was living in Tennessee (adjacent to the nationally known intentional community, The Farm) with her two young children at the time. But she wasn’t happy living there. “I asked for guidance on where to go next and a friend put a Museletter on the table. I knew instantly after reading it that we would go to Floyd. We left the same day,” she said, recalling that they arrived at the Harvest Moon Food Store, another community hub that was originally located in the noteBooks/Black Water Loft building. Neumann recalled that she immediately met someone at the Harvest Moon who offered them a place to stay. The Next Generation- Many of the early transplants have gone on to become prominent Floydians, and now some of their children are carrying on the traditions they forged. Logan Tiebout was a one-year old when he moved to Floyd from Florida with his parents, who were part of the alternative community. He met his wife Kelly, who grew up in Patrick County, when they both worked at Chateau Morrisette. When the couple’s first restaurant in Hillsville suffered fire damage, the community held a benefit to help them get back on their feet. Today, they run The Parkway Grille, above the Harvest Moon, and are raising their young daughter, Emory. Another couple building on community-minded living and the pioneering spirits of their parents are Hayden Hensley-Polseno and Rose McCutchan, owners of Red Rooster Coffee Roaster, a specialty coffee roasting company and café on E Main Street. Polseno-Hensley, son of studio potters Polseno and Hensley, is a Floyd County native, a writer, builder, coffee roaster and board member of SustainFloyd. Rose, whose parents found Floyd while attending Virginia Tech, helped run the family business at The Black Water Loft (2004 – 2017) and helped pioneer a Young Actors theater group in Floyd. Hayden-Polseno and McCutchan are parents to a young son, Aloysius. Today, young families are finding Floyd and settling here for many of the reasons that the back-to-the-land generation did. In 2014 Zephyr welcomed Jeni and Perrin Heartway (a holistic veterinarian) and their children to the community of four families. The Heartways discovered Floyd on the recommendation of a friend and found a home for sale at Zephyr through an intentional community directory. They had two children when they moved from Chapel Hill, NC, and their twins were born in Floyd, which helped them fit right in, since Zephyr was already the birthplace of two other sets of twins. Photos: 1. Ruth Bason guiding three of her grandchildren on ponies at Travianna sometime during the early to mid ‘80s. 2. 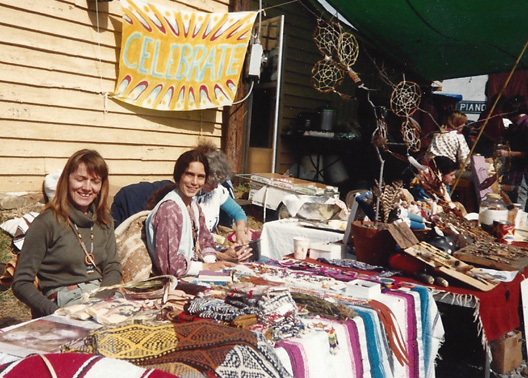 One of the early Barter Faires, a Blue Mountain School (a parent run cooperative founded by early transplants) fundraiser that was popular for many years. It was frequently held on the grounds of The Pine Tavern, but this one was located where the parking lot next The Station is now. 3. A seasonal celebration at the Blue Mountain School from the early 1990s. 4. For decades Polseno-Hensley have shown their pottery in this once store/gas station, located on their property off the Blue Ridge Parkway. 5. A community Thanksgiving at Zephyr circa 1990. 2. A large community circle at the Blue Mountain School’s 30th celebration, 2012. 3. Homespun Museletters 6. Market farmer Perky VanWyk at the Floyd Farmers Market. VanWyk, who was a one-time resident of Travianna Farm now lives at the Left Bank community. 7. Kelly and Logan Tiebout and their daughter Emory at the entrance of the Parkway Grille. My name is Charlie Richie Jr and I’m the Associate Publisher for the Backwoodsman Magazine. I’m also a freelance outdoor TV producer and I’m working on a project with RIVR Media, which is a TV production company based out of Knoxville, TN. The project is tentatively titled “Wild Appalachia”. A person that I contacted at the Floyd Art Center mentioned your name and said you might be able to assist me. This person didn’t claim to know you, he’s a fan of your work. The premise of our show is to feature people living off-grid & maintaining & preserving the Appalachian way of life. We’ve concentrated the show to feature people who live in or near Floyd County, VA. I have a lot of respect for the Appalachian culture and I’m also a huge music fan the importance of the area. I’m reaching out to you because we are searching for people who live off-grid in the area that would be interested in being on the show. Of course there would be financial compensation for appearing on the show. We are currently looking for a male in their 20’s to 40’s age range that live off-grid and live in or near Floyd County. They could either live alone or with a family or even with roommates. Any help would be greatly appreciated and I could offer to promote your blog in my magazine or I could give you some free subscriptions (if desired) in exchange for information that leads to that person being featured on our show. The History Channel and the Discovery Channel are both very interested in this concept. Please let me know if you have any questions. My contact info is listed below. I may have someone that could fit your description. You may contact me by email or phone at: 540-798-1828.
you may find me on facebook, where I found this blog post. Thanks!